On Friday I decided after breakfast to go to the top of the island. 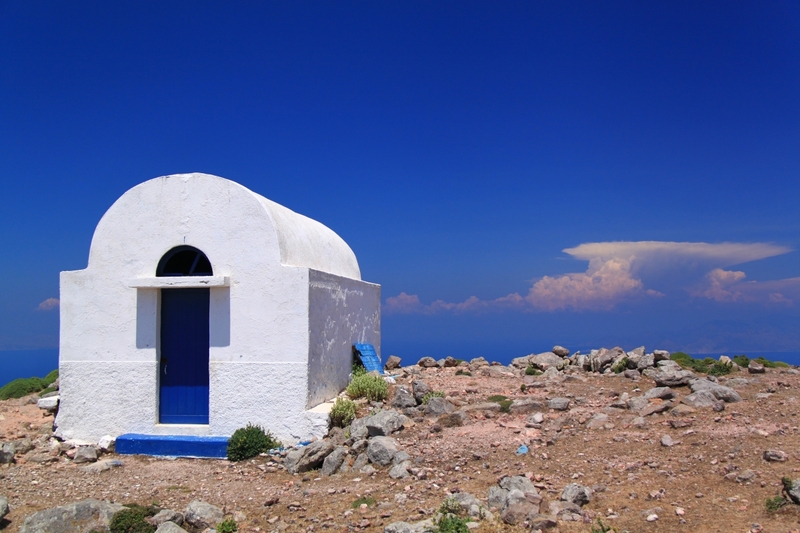 The highest mountain on Nisyros, Oros (Mount) Diavatis, is 700 metres and with a generally very good path because there is a chapel on top, as is often the case, dedicated to the Prophet Elijah. Enfys and I found our way there by accident many years ago. We had been doing a walk and decided it was too early to go back to the hotel so we saw a footpath and just followed it. We have been back every year since though it became increasingly challenging for Enfys in recent years and so more of an achievement. 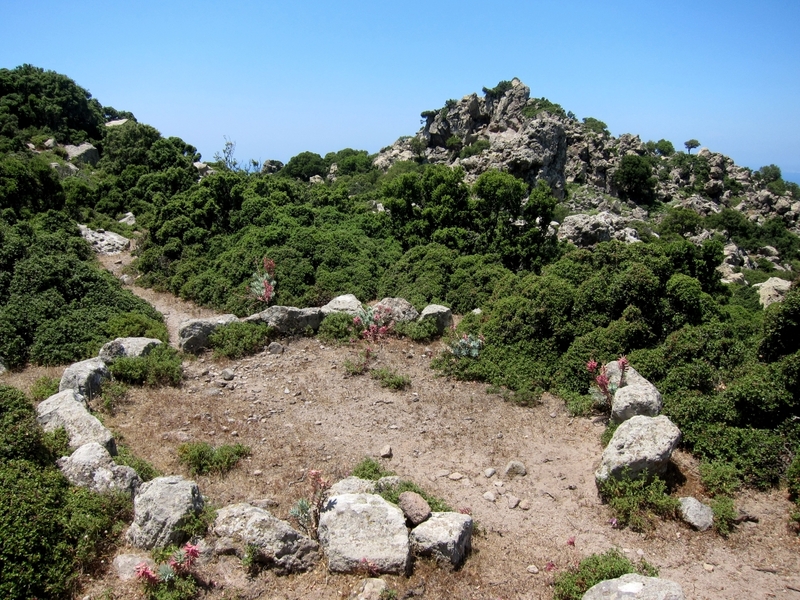 I decided to go via the ancient settlement of Nifios which is a longer way round but gives additional interest. 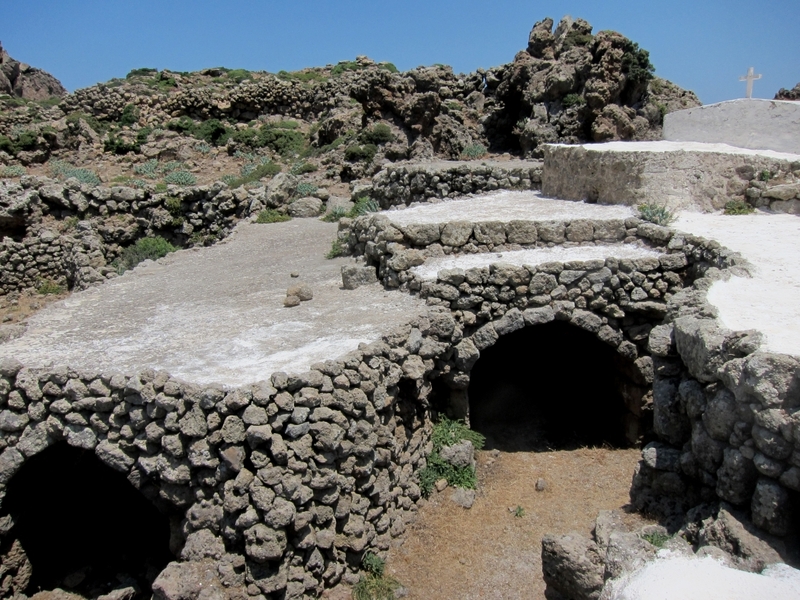 Nifios is reckoned to date back to the Minoans from Crete and it certainly has an air of great antiquity. The entrance to the settlement is marked by ‘Horns of Consecration’ carved out of the rock and beneath it is a cave which at some stage was probably occupied. There are a great many things to capture the interest in the high-level caldera but I didn’t spend much time there this time, just enough to have my banana and nutbar and take a few more photos of the settlement built onto the rocks to add to the vast numbers I already have. Incredible to think that 3 millennia or more ago someone could well have been sitting on the very spot where I’m nibbling my nutbar. I intend to go back specifically to spend more time exploring the valley. Then I went over the col beyond the ancient village, amazing in itself with signs of early settlement including a threshing circle bisected by the path. 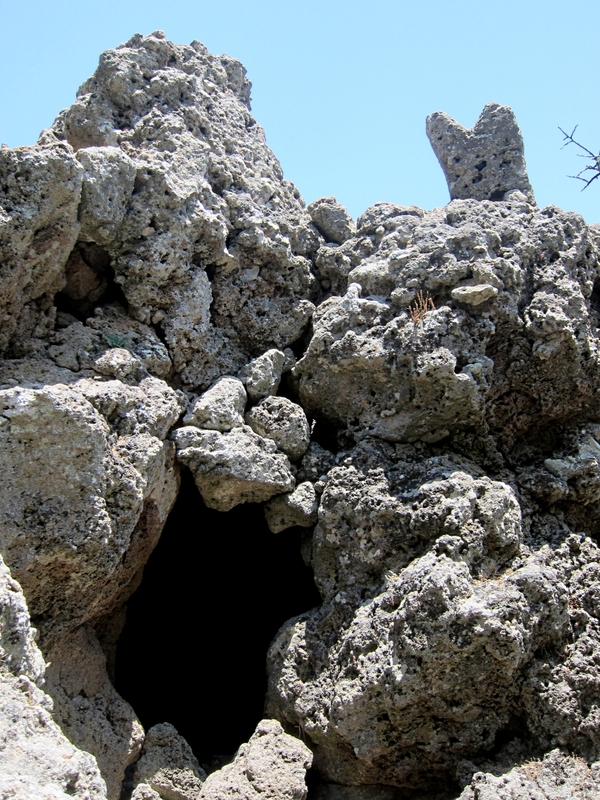 This then joins the main paved path up the mountain at a point well marked by a towering finger of rock. 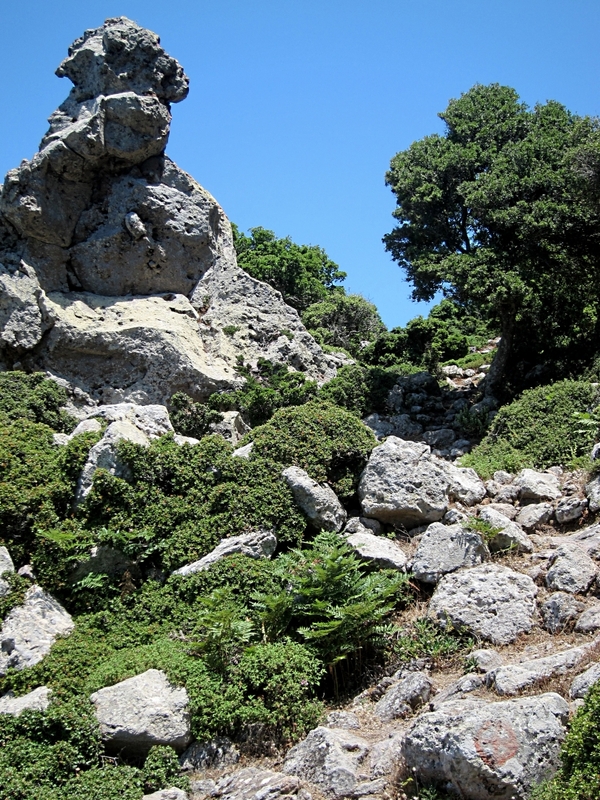 It is an unremitting pull to the top with no let-up in the gradient and the last section is very loose underfoot. 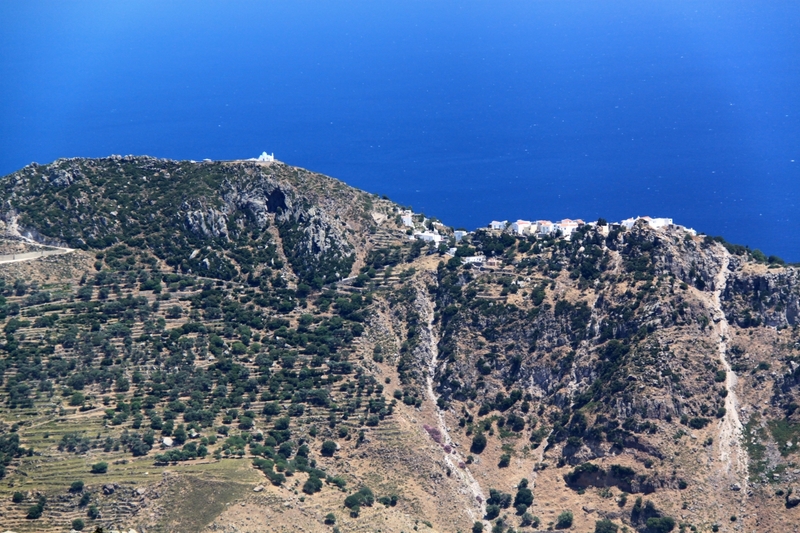 But it is certainly worth it when you get there with views to the South of Nikia, the crater-rim village on the opposite side of the caldera, to the North views over the ‘pumice island’ of Yiali to Kos, and to the East views of thunderclouds over Turkey. It always strikes me that just across the water Turkey is a different continent, completely different religion and culture, a different world. Yet in the times of the New Testament this was counted as Greek and places which St Paul visited, such as Ephesus, are in what is now Turkey. He sailed up and down the bit of sea I’m looking across a couple of times. In fact Western Turkey was Greek by culture and language until Attaturk issued an ultimatum in the early part of the 20th century (1921 I think)which I think boiled down to ‘get out or get killed’ and the Greeks had no choice but to leave, some going to other parts of Greece but many going to America, Australia and Russia. I keep intending to brush up on that part of Greek history …. along with more or less all of Greek history actually. Back to the top of Oros Diavatis. 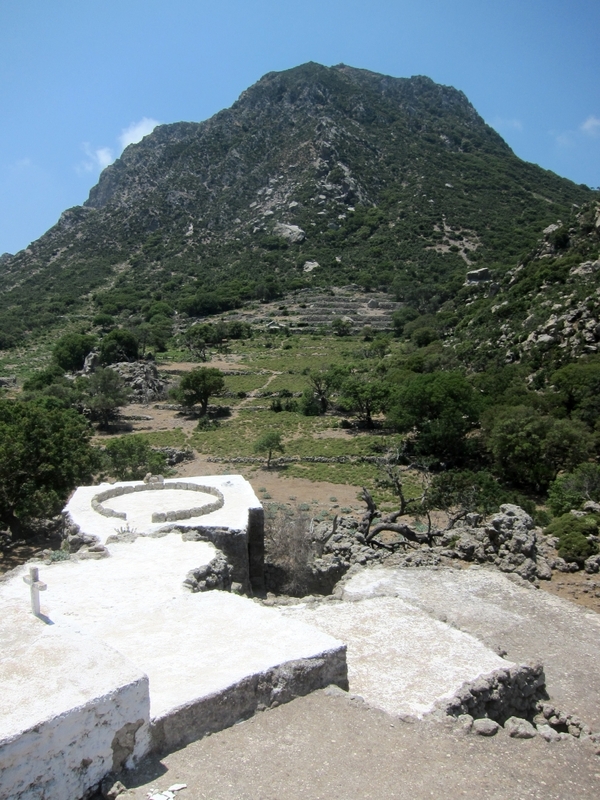 It’s so worthwhile climbing up there and has such rich memories I’ll probably do it again before I leave Nisyros. This entry was posted in Greece, Greece 2011 and tagged Greece, Nifios, Nikia, Nisyros, Oros Diavatis. Bookmark the permalink.